Meteor House » The Best of Farmerphile! 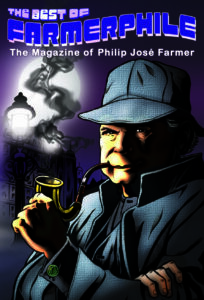 Farmerphile: The Magazine of Philip José Farmer was a quarterly fanzine that ran fifteen issues from July 2005 to January 2009. Michael Croteau served as Publisher for all fifteen issues; Christopher Paul Carey and Paul Spiteri coedited the first ten issues, while Spiteri and Win Scott Eckert coedited the last five. Thanks to the generosity of Philip José Farmer and his “Magic Filing Cabinet,” Farmerphile published—for the first time anywhere—short stories (mostly not science fiction), excerpts, articles, speeches, and letters written by Farmer. It even serialized the novel Up from the Bottomless Pit (not included in this collection, but forthcoming from Meteor House). Farmerphile also contained articles and appreciations from Farmer’s fans and from his fellow science fiction authors, from critiques of his work to stories of personal encounters, and everything between. A complete list of the original contents of all fifteen issues can be found here. Now the hard part: narrowing down so much content into one “Best of” collection. This was much harder than it sounds, as nearly all the content was worthy of inclusion. So, we focused on broadly covering as much ground as possible, as well as including pieces that touched on Farmer’s personal life. Assembled here is a wealth of information about one of the greatest science fiction writers of all time along, with some of his earliest writing. The Best of Farmerphile is available in two editions: a Trade Paperback and a Hardcover Limited Edition. The hardcover is not “officially” a signed limited edition, but when the book debuts at PulpFest/FarmerCon XII in late July 2017, we will get as many contributors on hand as possible to sign it before we ship the books to those preordered (shipping will occur immediately after PulpFest/FarmerCon XII). Below is the table of contents as of January 26th, which would have been Farmer’s 99th birthday. Contents are subject to change, and by change we mean they are likely to grow a bit. 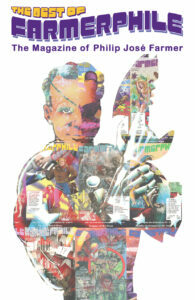 The trade paperback edition is $29 (plus shipping). The hardcover limited edition is $40 (plus shipping). Or you can preorder them together for only $62—that’s $7 off (plus you’ll save even more with combined shipping)! The book is due out in July 2017; preorder early to ensure you get a copy of the limited edition hardcover. As always, the print run on the limited edition will be determined by the number of preorders received. Not many copies beyond those reserved will be printed. NOTE: due to the complexities of publishing rights, no ebook edition will be produced! Make sure you select the correct Paypal button and the correct shipping option.